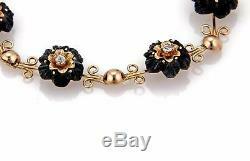 Victorian Old Mine Cut Diamond Carved Wood 18k Rose Gold 6 Rose Charm Fancy Bracelet. 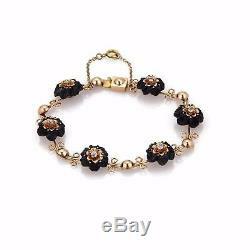 This is a lovely Victorian bracelet, well crafted from 18k rose gold featuring old style half dome and scroll design links mixed with 6 rose charms carved from black lacquer wood with an old mine cut diamond mounted in the center of each rose with yellow gold decor. The piece secures with a push in clasp and chain attached for added security. 7" long Charms: 0.44" diameter Diamond: Old Mine Cut 36 points I-J SI2. International Buyers - Please Note. We will not under-value merchandise or mark the item as a gift on custom forms. Doing so is against United States and International laws. Get Images that Make Supersized Seem Small. 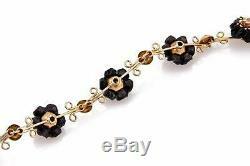 The item "Victorian Old Mine Cut Diamond Carved Wood 18k Rose Gold 6 Charms Bracelet" is in sale since Monday, November 26, 2018. This item is in the category "Jewelry & Watches\Vintage & Antique Jewelry\Fine\Victorian, Edwardian 1837-1910\Bracelets". The seller is "mycollectioninc" and is located in Boca Raton, Florida. This item can be shipped to United States, Canada, United Kingdom, Denmark, Romania, Slovakia, Bulgaria, Czech republic, Finland, Hungary, Latvia, Lithuania, Malta, Estonia, Australia, Greece, Portugal, Cyprus, Slovenia, Sweden, Belgium, France, Ireland, Netherlands, Poland, Spain, Italy, Germany, Austria, Bahamas, Switzerland, Norway, Saudi arabia, United arab emirates, Qatar, Kuwait, Bahrain, Croatia, Malaysia, Brazil, Colombia, Viet nam.